While volunteering with the Ocean Wonders team, you will have the opportunity to learn about and work with 16 different species of sharks and rays as well as many different species of fish and invertebrates. Volunteers assist with filter cleaning and maintenance, exhibit and behind the scenes cleaning, diet preparation, feedings, training sessions, and other projects as they arise. Volunteers will learn about the basic biology of the animals we care for, how we train the animals during feeds, the importance of quarantine protocols, concepts behind the filtration we use, and good general aquarist practices. Most volunteers have the opportunity to observe veterinary exams, and the acclimation and transfer of animals from quarantine to exhibit. Please send all applications for Ocean Wonders: Sharks! to Nicole Ethier. 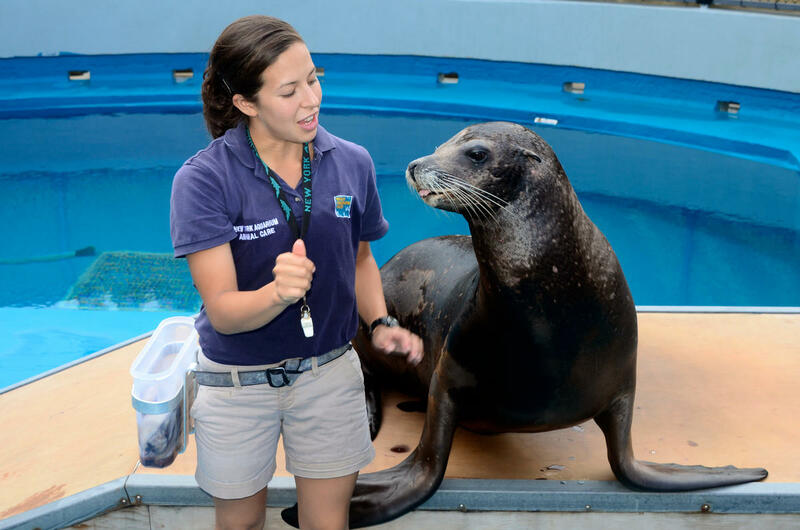 Our Behavioral Husbandry Division works primarily with California sea lions. The staff and volunteers also work closely with the keepers in the marine mammal sections of our Sea Cliffs. Behind the scenes, trainers teach the animals behaviors that focus on monitoring their health. This division's volunteers are a vital part of the training team. They leave with skills invaluable in the highly competitive field of marine mammal care. Please note: Although the New York Aquarium is renowned for its success in breeding beluga whales, our whales are currently on loan to the Georgia Aquarium, involved in a national Beluga Whale breeding program. Individuals interested in caring for fish and aquatic invertebrates will find the volunteer programs at Explore the Shore or Conservation Hall a practical and rewarding experience. In these divisions, volunteers work with a variety of fresh and saltwater marine organisms, including fish, amphibians, reptiles, invertebrates, and corals. Responsibilities include filter cleaning and maintenance, diet preparation and feeding, monitoring basic parameters such as temperature and salinity, new animal acclimation and quarantine, observation of breeding behaviors and general health, as well as the possibility of working with endangered species. Volunteers gain hands-on experience and a familiarity with the daily tasks of the professional aquarist. The Sea Cliffs Division works with a wide variety of marine animals, including pinnipeds, otters, and penguins. Volunteers will be responsible for maintaining the cleanliness of animal exhibits, creating and providing enrichment for animals, and assisting staff as needed. Volunteers will have the opportunity to observe training sessions and learn about caring for marine animals and birds. The Sea Cliffs volunteers play an important role in the department and will leave with valuable skills in the animal care field. To apply, submit the completed Volunteer Applicant Personal Information form with a resume and cover letter to Joseph Gessert, the Volunteer Coordinator (address below). You may apply to more than one division using the appropriate application. You should also indicate your availability for working as well as for interviews. When your papers are received, they will be forwarded to the appropriate division. If he/she is interested in your application, the division supervisor will contact you to arrange an interview. Please do not send your papers directly to any division of the Animal Exhibits Department. No housing is provided to interns or volunteers. Internships are unpaid and are arranged with colleges and universities on a case-by-case basis to meet the needs of their students. When applying for a summer position, application must arrive no later than the end of March.